Although Japan had heard about Halloween before, from American movies and other Western media, the holiday was properly introduced to the country by Tokyo Disneyland. 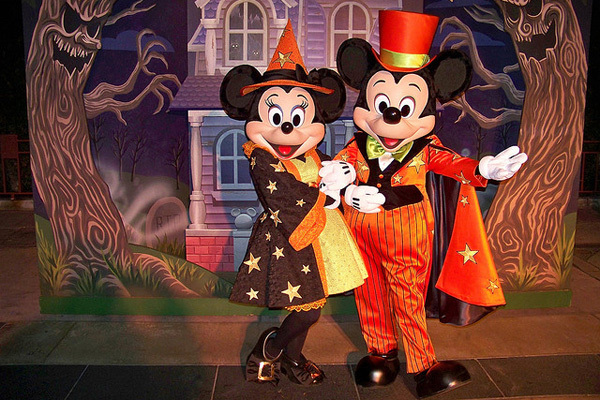 On 31st October 1997, all visitors to Tokyo Disneyland were invited to wear costumes and take part in the first “Disney Happy Halloween” celebration. The event was successful enough to warrant being held again, and interest continued to build until, in the year 2000, Tokyo Disneyland held its first “Halloween Twilight Parade”, which featured 400 visitors and various Disney characters in elaborately designed Halloween costumes. Since then the interest in Halloween has continued to grow, and the Halloween attractions at Tokyo Disneyland (website in Japanese) this year started as early as 8th September. Soon Japan’s interest in Halloween was strong enough to expand beyond Tokyo Disneyland and other theme parks, to the streets of major cities. As the land of Cosplay and summer street festivals, the modern-day aspects of Halloween are a perfect fit for Japan, and it did not take long for festival planners in major cities to realise this and begin holding Halloween-themed street parades. 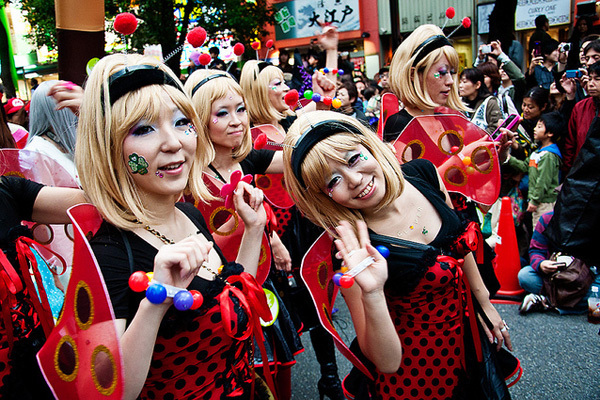 The largest of these street parades is the Kawasaki Halloween Parade in Kanagawa (website in Japanese). This festival features Halloween decorations, activities such as Jack-O-Lantern carving and face painting, and, most importantly, the spectacular parade, which this year will include 3500 people in costume proceeding down the streets of Kanagawa. …And Then the Themed Foods! Recent years have seen many of Japan’s well-known shop brands and food manufacturers joining in on the Halloween festivities with limited edition, Halloween themed foods. Mister Donut, for instance, has released a special Halloween range of pumpkin flavoured, Jack-O-Lantern shaped doughnuts for the past few years, tying their range in with well-known characters such as Snoopy and Hello Kitty. Baskin Robbins has already launched their spectacular range (website in Japanese) of Halloween treats this year, and made all of us in the Japan Centre online hub wish we were in a Japanese Baskin Robbins right now. However, Japan Centre does have ready access to Glico’s “Lovely Halloween” range of Pocky and Pretz flavours, as do all of you Inside Japan Centre readers. But What About the Scary Stories? In the Western countries from which Halloween originated, the holiday is understood to traditionally be an occasion to remember the dead and communicate with the spirits of the departed, hence the heavy focus on supernatural creatures and ghost stories during the present-day celebrations. In Japan, however, Halloween does not have that original association and is seen as a fun excuse to wear costumes and eat pumpkin flavoured foods. The scary stories and remembering of the dead happens in mid-August during Obon (お盆); a Buddhist tradition where families honour the spirits of their ancestors. 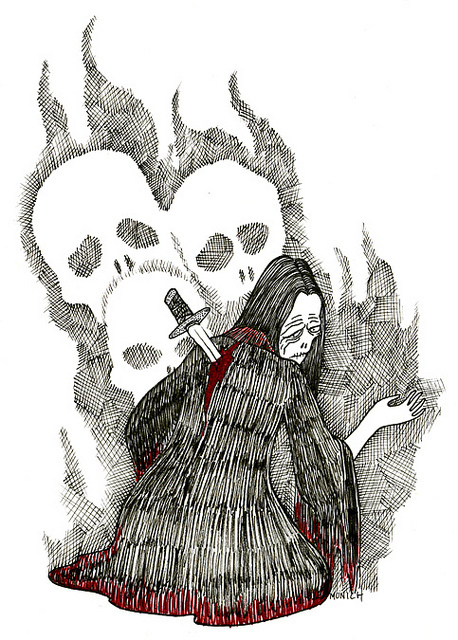 If you are ever looking for a different kind of scary ghost story, ask your Japanese friends to share any stories they know about Yuurei (幽霊); the ghosts of people who died in unfair circumstances and have come back to seek revenge. So that is Halloween in Japan. Are you ready to celebrate yet? Take a look at Japan Centre’s great range of Halloween snacks, sakes and other party foods. Posted in Food and tagged festival, halloween. Bookmark the permalink.